The LISM Mentorship application is now open! Guess what?! Everyone who’s been waiting for the application to open for the next round of the Life In Student Ministry Mentorships, it’s open! We have an amazing team of 27 youth ministry veterans on board, all of whom have been doing “life in student ministry” for more than 10 years. After skipping the Fall 2011 round due to my own time limitations for pulling it off, we are super excited for this Spring 2011 round! Check out the stories from Tobey Nichols and Seth Rowe to see how this mentorship process impacted them and their ministry. Also check out a couple other former mentees sharing their stories on YouTube. If you have been in youth ministry for 5 years or fewer, we want to serve you with FREE one-on-one youth ministry mentoring for 10 weeks straight. Here’s how it works. 1. Read the Overview of the Mentorship as well as the goals, expectations, and the stories of former mentees. 2. If you’ve been in youth ministry for 5 years or fewer and would like a mentor to consider you, fill out the application in its entirety. It is open to anyone who serves in youth ministry in any capacity, whether that be on a volunteer basis or as a full-time youth pastor. The application closes on January 30. After January 30, no further applications will be accepted for this round. 3. The team of mentors will pour through all the applications and each will select a mentee. If you are selected, I will email you by February 6 and put you and your mentor in touch. 5. During the week of February 6, you and your mentor will connect to determine a time each week for your one-on-one phone conversation. 6. 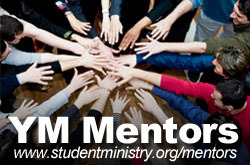 The 10 weeks of mentoring starts on February 14 and ends on April 24. Whether you’re accepted or not, whether you’ve been in youth ministry for 5 years or 10 years, MinistryQuestions.com is always available. You can receive a lot of good advice, input, ideas, and recommendations from that online community of youth workers.